St. Paul, Minn. — (AP) The 2006 election is more than 20 months off, but Monday at the Capitol it seemed like the campaign has already started. Two Republican lawmakers declared themselves candidates for the 6th District Congressional seat, the latest in a chain reaction set off last week when U.S. Sen. Mark Dayton announced he won't seek a second term. Monday's entrants were state Sen. Michele Bachmann, R-Stillwater, and state Rep. Jim Knoblach, R-St. Cloud. Both want to succeed U.S. Rep. Mark Kennedy, the Republican who announced his U.S. Senate candidacy last Friday. "It's insane that we're talking about the 2006 election already," said Sarah Janecek, a Republican lobbyist and political analyst. "But once one person jumps in, everyone else feels like they can't wait." Knoblach, the chairman of the powerful House Ways and Means Committee, said he hadn't planned to enter the race so early but felt he had little choice. "I wouldn't be announcing if others weren't," Knoblach said. "My main goal of the next few months is the legislative session." The low-key Knoblach didn't call a press conference, instead sharing the news personally with reporters at the state Capitol. By contrast, Bachmann - who earned both strong supporters and detractors last year as the chief legislative proponent of a state constitutional ban on gay marriage - made her announcement at a press conference attended by family, several fellow senators and a large group of supporters. An outspoken social conservative, Bachmann signaled she won't back down from her opposition to gay marriage, abortion and her views on other hot-button issues. 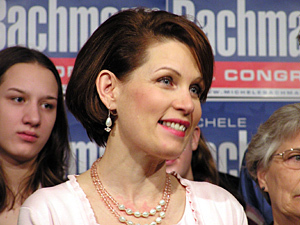 Even as she mounts a campaign, Bachmann said she'd remain chief sponsor of the gay marriage ban, which Republicans plan to push again this year. "I want to be a voice for all the people who do everything right when they wake up in the morning," said Bachmann, a mother of five. While Knoblach may not share Bachmann's talent for making headlines, he signaled his campaign is serious. He's already hired as a consultant Pat Fiske, a Republican operative who has previously served as Kennedy's chief of staff in Congress. The 6th District includes northern Twin Cities suburbs and the St. Cloud area. Both Bachmann and Knoblach said they'd need to raise several million dollars for the race. Both also said they'd drop out if Kennedy were to not get the party's Senate nod and decide to seek re-election to the House. In one notable divergence, Bachmann said she would leave the race if she fails to get the endorsement of 6th District Republican delegates. Knoblach left a little wiggle room. "I fully intend to get the endorsement," Knoblach said. Asked if he'd run in the primary without it, Knoblach said it's "too early to say if I'll do that." Other Republicans are likely to enter the race, including Cheri Pierson Yecke, the former state education commissioner who lost her job last year after the DFL-controlled state Senate voted her down. A number of others are said to be considering the race, including Bachmann's fellow senators Michelle Fischbach and Mark Ourada, Knoblach's House colleague Phil Krinkie, and Secretary of State Mary Kiffmeyer. Among Democrats, the top prospect is children's advocate Patty Wetterling, who lost to Kennedy last year and is now considering another try, or possibly a U.S. Senate run. A Wetterling confidant said Monday that Wetterling would announce her plans next week. Wetterling won praise from Democrats for making a strong effort against Kennedy, and she is widely known statewide as the mother of kidnapping victim Jacob Wetterling. "Her name identification is pretty much 100 percent," said Mike Erlandson, the state DFL chairman. "If she gets into the race, she's not just the best DFL candidate - she's the best candidate."